It’s September and Wanaka is blooming with beautiful cherry blossom. 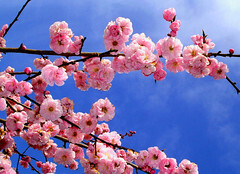 The spring is so welcome after the freezing winter. We wander around and see these everywhere. The locals tell me this is where the bikers used to all meet. A blossom festival, bikers? Only in NZ! We will go down tomorrow to check it out.